America's golden child, Shiloh Jolie-Pitt, has received a multitude of publicity after being spotted with a new look. Brad and Angie's little girl has been called a tomboy by her famous parents in the past, but concerned fans are outraged at the three-year-old's new do. 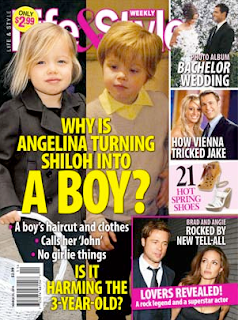 Life&Style magazine even made Shiloh their cover girl, with the caption "Why is Angelina turning Shiloh into a boy?" Really, people? Is Shiloh's haircut really that big of a deal? I am sure the haircut is not harming her. In fact, I believe it is helping her independence. This is a girl who knows what she wants and how to get it. She dresses herself and takes an obvious interest in how she looks. So what if she is the polar opposite of label-loving Suri Cruise? I think Shiloh rocks the boy-cut better than her fellow celebs.